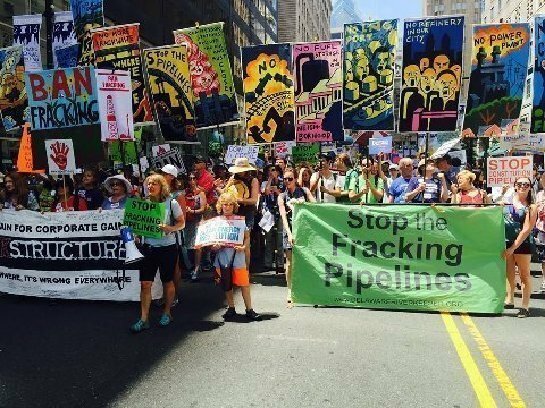 July 24, 2016—Philadelphia, PA: The March for a Clean Energy Revolution, held the day before the Democratic National Convention, voiced the people’s desire for 100% Renewable energy and the protection of all life on Planet Earth. Temperature in the 90s might have made us uncomfortable, but it served to heat up our passion for environmental justice. 10,000 marchers called for a swift and just transition from dirty energy to clean power. Americans Against Fracking and Pennsylvanians Against Fracking convened the March for Clean Energy, which was endorsed by more than 900 faith, labor, environmental, indigenous, health, political, justice and student organizations from all 50 states, including the Dominican Sisters of Amityville, Blauvelt, Caldwell, Hope, Maryknoll and Sparkill. There was a large faith contingent including many Catholic groups including sisters from various congregations. With 10,000 people, we never even saw the faith contingent! We found ourselves standing by the Elders contingent (which we certainly could have joined) and Veterans For Peace whose banner read “no more war; no more warming,” but we Dominicans chose to march with the TPP contingent. Dominican Sisters Jean Fallon, Ceil Lavan, Pat Langton & Cely Byrnes waiting in the shade to march in the Clean Energy Revolution. 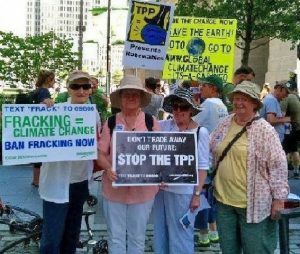 The Trans Pacific Partnership (TPP), a proposed agreement between the U.S. and several Asian nations, could have catastrophic consequences for climate-change. Scientific study tells us that about 80 percent of the world’s fossil fuels needs to remain in the ground, however coal, natural gas, and oil left in the ground does not benefit the fossil fuel industry. If the U.S. joins the TPP, participating corporations will be able to sue our government for interfering with their business, e.g. they could stop U.S. environmental protections in order to protect their profits. If this sounds absurd, consider this: Under NAFTA (North American Free Trade Agreement) Lone Pine Resources, a U.S. mining company, sued the Canadian province of Quebec in 2013 for banning fracking. The company said the ban cost them $250 million and that under NAFTA, Quebec is liable for the lost revenue. That lawsuit is ongoing. With Pope Francis and millions of others, we believe the demand for Clean Energy is a moral issue. While climate change will eventually lead to the destruction of much life on Planet Earth, it is already being demonstrated in the extreme floods, fires, earthquakes, storms, temperature, droughts, etc., but it is the poorest nations that are most in danger and suffering the most right now. The point of the march was to bring national attention and the attention of the DNC to Climate Change. 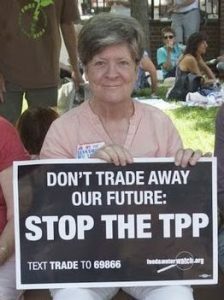 If you watched any of the convention you are aware that the TPP is not on the Democratic Platform. It’s up to us to make sure that it gets the attention it needs and never passes Congress.